The China IoT market is expected to grow from USD 11.00 Billion in 2015 to USD 121.45 Billion by 2022, at a CAGR of 41.1% between 2016 and 2022. The base year considered for the study is 2015 and the forecast is provided for the period between 2016 and 2022. The objective of the report is to provide a detailed analysis of the market based on hardware, software, platform, service, and application. To estimate the size of the China IoT market, top players and their shares in the market have been considered. This research study involves an extensive use of secondary sources such as annual and financial reports of top players, presentations, press releases, journals, paid databases, and interviews with experts. The research methodology is explained below. The China IoT market size has been calculated using the top-down and bottom-up methods. In bottom-up approach, the number of additional components going into a smart devices are calculated, then the number of extra devices is multiplied with the volume of these devices in China to arrive total volume of devices, which is further multiplied by their average selling price (ASP). The top hardware numbers are arrived at, and a similar process is followed for the software, platform, services, and applications. Finally, all numbers are added to estimate the overall China IoT market. After arriving at the overall market size, the total market has been split into several segments and subsegments and confirmed with experts. 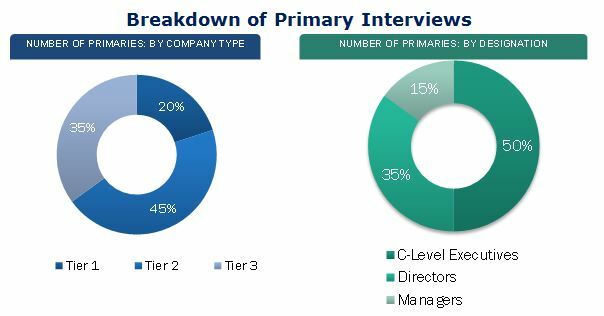 The figure below shows the breakdown of primaries conducted during the research study on the basis of company, designation, and region. The China IoT ecosystem comprises major hardware providers such as Xiaomi Inc. (China), Qualcomm Incorporated (U.S.), MediaTek Inc. (Taiwan), and Huawei Investment & Holding Co., Ltd. (China), network providers such as China Mobile Limited (Hong Kong), China Unicom (Hong Kong) Ltd. (Hong Kong), and China Telecom Corporation Limited (Beijing); and software providers such as International Business Machines (IBM) Corporation (U.S.), Microsoft Corporation (U.S.), and Alibaba Group Holding Ltd. (China). The study answers several questions for the stakeholders, primarily, which market segments to focus on in the next two to five years for prioritizing efforts and investments. 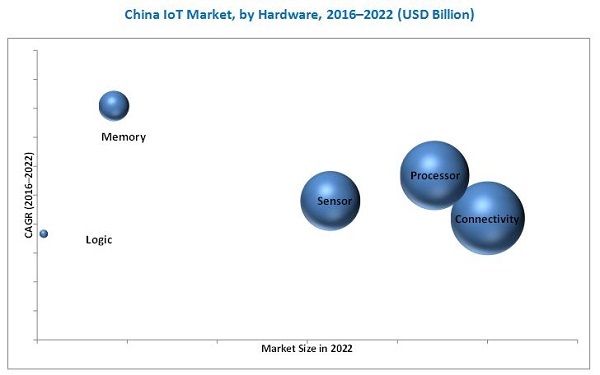 This research report categorizes the China IoT market on the basis of hardware (processor, memory, logic, sensor, and connectivity), service (professional and managed services), by software, platform, and application. The China IoT market is expected to have a high growth potential till 2022. The total market is expected to reach USD 121.45 Billion by 2022 from USD 11.00 Billion in 2015, at a CAGR of 41.1% between 2016 and 2022. The major driving factors for the growth of the market are the growing demand for smartphones and other connecting devices, increasing internet penetration, rising trends of industrial automation, and mainstream adoption of cloud computing. This report covers the China IoT market on the basis of hardware, software, platform, service, and application. The automotive & transportation application holds the largest share of the market on the basis of application. IoT assist states, cities, and towns across the China to meet the increasing demand for the surface transportation system. This application assists in enhanced speed monitoring, traffic counting, presence detection, headway measurement, navigation, and vehicle classification. Professional services hold the largest market size in terms of application. The market for managed services is expected to grow at the highest CAGR during the forecast period. These services are crucial as they are directly related to customer experience and help the companies sustain their positions in the market. Managed services offer technical skills that are required to maintain and update software in the IoT ecosystem. In the software segment, data management is the largest for IoT in China. It plays a vital role in the overall China IoT market as IoT devices produce enormous amounts of data that pose a challenge for the providers to deal with efficiently. To generate insights from the huge amount of data, organizations require data management solutions to manage structured as well as unstructured data. In terms of hardware, the market for memory devices is expected to grow at the highest CAGR during the forecast period. As the data in IoT devices need to be constantly updated, the endurance of memory devices is an important parameter. Memory devices are increasingly being adopted in the Chino IoT with the introduction of low-power-consuming and high-performance chips. In the platform segment, the device management platform is estimated to hold the largest market size and to grow at the highest CAGR during the forecast period. The device management platform assists organizations in managing, tracking, securing, and sustaining the abundant devices that are used in the organizations. The complex network infrastructure of IoT and high power consumption by connected devices are the major restraining factors for the China IoT market. The China IoT includes companies for major hardware providers such as Xiaomi Inc. (China), Qualcomm Incorporated (U.S.), MediaTek Inc. (Taiwan), and Huawei Investment & Holding Co., Ltd. (China); network providers such as China Mobile Limited (Hong Kong), China Unicom (Hong Kong) Ltd. (Hong Kong), and China Telecom Corporation Limited (Beijing); and software providers such as International Business Machines (IBM) Corporation (U.S.), Microsoft Corporation (U.S.), and Alibaba Group Holding Ltd. (China). These players adopted various strategies such as new product developments, partnerships, collaborations, and business expansions to cater to the needs of this market. 14.2.1 Huawei Investment & Holding Co., Ltd.
14.3.3 Alibaba Group Holding Ltd.
14.4.2 China Unicom (Hong Kong) Ltd.
14.4.3 China Telecom Corp. Ltd.